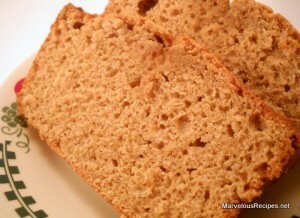 A wonderfully moist, apple flavored bread that goes great with coffee for breakfast! Delicious warm or cold. 1. Preheat oven to 350 degrees F. Grease and flour the bottom and sides of a 9×5-inch loaf pan; set aside. 2. In a large bowl, combine the flour, baking powder, cinnamon, baking soda, salt and nutmeg. Make a well in the center of the flour mixture; set aside. 3. In a medium bowl, combine the eggs, granulated sugar, brown sugar, apple butter and oil. Add the egg mixture all at once to the flour mixture. Stir just until moistened; spoon batter into prepared loaf pan. 4. Bake for 45 to 55 minutes or until a wooden toothpick inserted near the center comes out clean. Cool in the pan on wire rack for 10 minutes. Remove from pan and cool completely on a wire rack. Wrap cooled bread with plastic wrap and store overnight in the refrigerator before serving. Makes 1 loaf (16 slices).